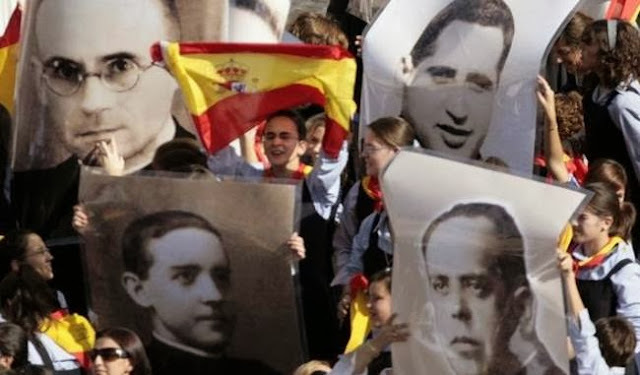 A ceremony was held in Tarragona, Spain, on October 13, to mark the beatification of 522 Spaniards who died at the hands of enemies of the Catholic Church before and during the Spanish Civil War in the 1930s. Pope Francis broadcast a video message to the mass gathering, saying “I would like to express my heartfelt participation in the celebration taking place in Tarragona in which a great number of pastors, consecrated persons and lay faithful are being proclaimed Blessed martyrs." This beatification ceremony was historic since it included a nearly record number of martyrs. Besides the message directed to the congregation in Spain, Pope Francis also spoke to thousands who congregated in St Peter's Square for the Pope's weekly Angelus prayers and address. The pontiff said "Praise the Lord for their brave testimony. And through their intercession, we ask Him to free the world of all violence." Speaking to the crowds in Spain, the Pope said “Who are the martyrs? They are Christians won over by Christ, disciples who have understood fully the path to that “love to the extreme limit” that led Jesus to the Cross. There is no such thing as love in consignments or in portions. Total love: and when one loves truly, one loves to the very end. On the Cross, Jesus felt the weight of death, the weight of sin, but He entrusted Himself entirely to the Father, and He forgave. He barely uttered a word, but He gave His life. Christ precedes and awaits us in love; the martyrs imitated Him in loving to the very end." “The Holy Fathers say, 'Imitate the martyrs!' It is always necessary to die a little in order to come out of ourselves, to leave behind our selfishness, our comfort, our laziness, our sadness, and to open ourselves to God, and to others, especially those most in need." “We implore the intercession of the martyrs in order to be true Christians, Christians not only in words but in deeds; so as not to be mediocre Christians, Christians painted with a superficial gloss of Christianity but without substance; the martyrs were not glossed and painted Christians, they were were Christians to the very end. Let us ask their help to stay firm in faith, in spite of difficulties, and let us too nurture hope and be architects of brotherhood and solidarity." “And I ask you to pray for me. May Jesus bless them and the Holy Virgin protect them”. Among the martyrs beatified by Pope Francis was Angel Sanchez Rodriguez, an 18-year-old was killed along with his fellow Carmelites. The persecution of Christians during the Spanish Civil War was one of the worst in history and perhaps only rivaled by Rome's persecution of Christians during the early days of the Church.